Importance to maintain proper distance and angle between checker and puck carrier. 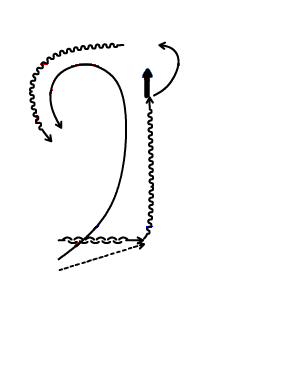 Player 1 skates backwards to centre ice and receives pass from player 2, pivots and heads toward goal for a shot. 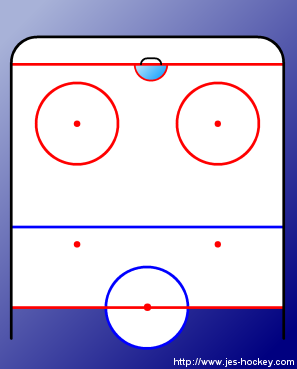 Once shot is taken, player 1 picks up a puck behind the goal, turns and skates between boards and face-off circle and tries to carry the puck up ice. Player 2, after the initial pass, chases player 1 and tries to stop the shot on goal. He then curls around face-off circle and follows player 1 attempting to check him a second time trying to head up ice. Players 3 & 4 start drill from other side once players 1 & 2 reach top of face-off circle.